Throughout the Tropics, glaciers are in retreat. Well-documented examples include Quelccaya [Thompson, et al. 1993], Huascaran [Byers, 2000; Kaser and Osmaston,2002], Zongo and Chacaltaya [Francou,et al 2003; Wagnon et al. 1999] in S. America; and the Lewis, Rwenzori and Kilimanjaro (more properly, Kibo) glaciers in East Africa [Hastenrath, 1984; Kaser and Osmaston, 2002]. There have been indications of widespread retreat of Himalayan glaciers, including Dasuopu in the subtropics, but a quantitative understanding of this region must await peer-reviewed analysis of the recently completed 46000-glacier Chinese Glacier Inventory. The case of Quelccaya, in the Andes, is especially interesting, because it provides direct evidence of an unusual recent warming trend. When the summit core was first drilled in 1976, the chemical composition of the ice showed well-preserved annual layering throughout its depth, accounting for a time span of 1500 years. When attempts were made to update the record by redrilling in 1991, it was found that the annual cycle had been wiped out over the top 20 meters of the core by percolation of meltwater from extensive melting of the ice surface since 1976. Melting of this sort had not occurred at the summit at any time during the previous 1500 years, and indicates an increase of 150 m, between 1976 and 1991, of the altitude at which significant melting occurs. A vivid animation showing the retreat of the Qori Kalis glacier flowing out of Quelccaya can be seen here. The widespread retreat is all the more notable because tropical mountain glaciers are old. They have survived thousands of years of natural climate fluctuations, only to dwindle at a time when other climate indicators — notably surface temperature — are showing the imprint of human influence on climate. Quelccaya is at least 1500 years old, Dasuopo is 9000 years old, and Huascaran has seen 19000 years. A date for the ultimate demise of these glaciers has not been fixed, but the Northern Ice Field on Kilimanjaro may be gone in as little as twenty years, after having survived the past 11,000 years. Figure 2. Top: The Yanapaccha glacier in the Huascaran National Park, Peru (from Byers, 2000). Bottom: The Elena Glacier on Mt. Stanley, in the Rwenzori massif near the Congo-Uganda border. (From Kaser and Osmaston, 2002). The tropical glaciers are certainly telling us that something unusual –and probably unprecedented for centuries or even millennia — has been happening to tropical climate. The problem at this point is to determine which of the many characteristics of climate change they are indicating, and to what extent these changes can be attributed to the train of events set in motion by anthropogenic increase of greenhouse gases. The reason there are tropical glaciers at all is that temperature decreases with altitude, as a consequence of the compressibility of air. As warm air rises, it expands and cools. Some of the cooling is offset by the heat released by condensation of water vapor, leading temperature to go down at a rate which is currently a little over 6.5 degrees C per kilometer of altitude. You may be slogging through the steamy lowlands at a temperature of 31C down in Tanga, but meanwhile, up atop Kilimanjaro at an altitude of 5892m, the temperature is a chilly -7 C.
The next ingredient needed to make a tropical glacier is precipitation, which at high, cold altitudes will fall as snow. The rate of snowfall needed to sustain a glacier depends on the rate of removal of glacier ice, called the ablation rate . In contrast to the extratropics, the daily average Tropical temperature varies little throughout the course of the year. Most of the surface temperature variability is on the diurnal (day-night) time scale. On the other hand, the seasonal cycle of precipitation is strong. In the tropics, seasons are characterized by wet vs. dry, rather than cold vs. hot. Another important feature of tropical climate is that horizontal temperature variations are weak once one goes above a relatively shallow layer near the Earth’s surface. This property arises from unassailable dynamic considerations having to do with the weak influence of the Earth’s rotation in the tropics, where the local vertical is nearly perpendicular to the Earth’s axis of rotation. Without strong Coriolis forces to balance the pressure differences that would be caused by temperature variations, the tropical mass redistributes itself until horizontal temperature gradients are nearly eliminated. [Pierrehumbert,1995; Sobel, et al.,2001] The horizontal homogeneity of temperature is something of an idealization, and becomes less valid towards the edge of the tropics, but temperature is much more uniform than other meteorological fields (precipitation, humidity, and cloudiness) which affect mountain glaciers. Because of the spatial homogeneity of tropical free-tropospheric temperature, when one sees tropical glaciers recede in concert, there is strong reason to presume that air temperature is playing a direct role, temperature being the one thing that is expected to change in lock-step throughout the tropics. For example, the uniform lowering of tropical snowline by about 900 meters during the Last Glacial Maximum is generally attributed to cooling [Porter 2001], and indeed provided the first indication that something was wrong with plankton-based estimates of tropical cooling during the glacial period. Figure 3. The 1950-1995 climatological mean temperature along the equator at the 500mb level. This level is approximately at the altitude of the summit of Kilimanjaro. Results are based on the NCEP data set. Note that the annual mean equatorial temperature varies by only 1.5 degrees C over the entire globe. There are two main ways that a body of snow or ice can lose mass: through melting (conversion of solid into liquid) or sublimation (conversion of solid into vapor). Both transformations require energy. It takes 8.5 times as much energy to convert a kilogram of ice into water vapor by sublimation as it does to convert the same kilogram into liquid water by melting. Therefore, if conditions allow the glacier surface to warm to 0 C, the amount of ablation that can be sustained by a given energy input increases dramatically. Sublimated water vapor is always carried away by the air, but the fate of meltwater has a strong effect on ablation by melting. Runoff from steep ice-cliffs, or through subglacial flow driven by water percolating through pores or fractures, will convert a high fraction of melting into ablation. If melt-water percolates into the glacier and re-freezes, the effect on ablation is more limited and indirect. A detailed description of the way the energy budget determines ablation can be found here, but a simplified version of the story goes as follows. In contrast to the midlatitude case, tropical glaciers do not have summertime melt seasons characterized by above-freezing air temperature. Lower altitude portions can be warmed directly by year-round exposure to above-freezing air, but at higher altitudes absorption of sunlight ultimately supplies all the energy which sustains ablation. However, the other terms in the energy balance directly or indirectly affect the amount of absorbed solar radiation which is available for ablation. These terms are sensitive to air temperature, atmospheric humidity, cloudiness, and wind. The daytime glacier surface temperature typically has to be greater than the air temperature in order to close the energy budget; in consequence, melting can occur even when the air temperature remains below freezing. Because melting is so much more energetically efficient than sublimation, the main way that moderate changes in atmospheric conditions — including air temperature– affect ablation is through changing the number of hours during which melting occurs, and the amount of energy available for melting. In particular, through infrared and turbulent heating effects, an increase in air temperature forces the glacier surface to warm, and makes it easier for melting to occur. In addition to adding mass to a glacier, precipitation has an indirect effect on glacier mass balance by changing the amount of sunlight the glacier absorbs. This occurs because fresh snow is much more reflective than old snow or bare ice. The reflectivity effect can be almost ten times more important than the effect of mass directly added by precipitation [Moelg and Hardy, 2004]. Because a thin layer of snow is just as reflective as a thick layer, the reflectivity effect depends more on the seasonal distribution of snowfall than the annual average amount. A healthy glacier has an accumulation zone at high elevations and an ablation zone at lower elevations; ice flow from the accumulation zone continually feeds glacier tongues that penetrate into the ablation zone. The altitude separating the accumulation zone from the ablation zone is known as the equilibrium line altitude. Glaciers shrink when climate change causes the equilibrium line to rise, but they stop at a new, smaller equilibrium size. However, if the equilibrium line rises to the summit of the mountain, the accumulation zone disappears altogether and the glacier is doomed. This has happened on Chacaltaya and, according to limited recent observations [Moelg and Hardy,2004], also on the summit glaciers of Kilimanjaro. 3. KILIMANJARO: ICON OR RED HERRING? A glacier is like your bank account. Whether your wealth is growing or dwindling depends on how much money you deposit vs. how much you withdraw each year. The Kilimanjaro glaciers are nearing bankruptcy, but is this due to excessive withdrawals or insufficient savings? This, in essence, is the question raised (but not settled) in the paper by Kaser et al. . This paper has played a valuable role in calling attention to important work on the physics of tropical glaciers, that can help in teasing out the record of tropical climate change from glacier retreat data. It has also been widely misquoted and misinterpreted. The aspect of the paper that has attracted the most attention is the claim that the retreat of the Kilimanjaro summit glaciers can be explained by precipitation reduction, without any compelling need to invoke a warming trend in local air temperature. The arguments are special to the high, cold glaciers of Kilimanjaro, and are not meant to generalize to other tropical glaciers. As the authors point out, even if the whole story comes down to precipitation changes which favor ablation, the persistence of these conditions throughout the 20th century still might be an indirect effect of global warming, via the remote effect of sea surface temperature on atmospheric circulation. The first major piece of evidence put forth in support of the precipitation hypothesis is that the retreat of the Kilimanjaro glaciers began in the late 19th century — before the beginning of significant anthropogenic warming — and coincided with a shift to drier conditions, as evidenced by a reduction in the level of Lake Victoria. This is indeed a convincing argument in favor of the early phase of the retreat (up to around 1900) being precipitation-driven. It would be a fallacy, however, to conclude that the late 19th century precipitation drop is the cause of the continued retreat, and ultimate demise, over the subsequent century or so. After all, precipitation went down in the late 19th century, and Lake Victoria found an equilibrium at a new, lower level without drying up and disappearing. Why should it be any different for the Kilimanjaro glacier, which is also a matter of finding an equilibrium where rate of mass in equals rate of mass out? The association of the initial retreat with precipitation changes has no bearing on this question. Most of the field studies cited in support of the dominance of precipitation effects for East African glacier retreat only support the role of precipitation in the initial stages of the retreat, up to the early 1900’s. For example, [Kruss 1983] has this to say about the Lewis glacier on Mt. Kenya: “A decrease in the annual precipitation on the order of 150mm in the last quarter of the 19th century, followed by a secular air temperature rise of a few tenths of a degree centigrade during the first half of the 20th century, together with associated albedo and cloudiness variation, constitute the most likely cause of the Lewis Glacier wastage during the last 100 years.” This conclusion is repeated in [Hastenrath 1984]. Moreover, if one only looks at the Lake Victoria level since 1880 one gets the mistaken impression that the high precipitation regime in 1880 was somehow “normal” and that the subsequent shift to drier conditions puts the glacier in a much drier environment than it had previously encountered. The fact is that wet-dry shifts of a similar magnitude are common throughout the record. It would be more correct to say that 1880 represented the center of a wet spike lasting hardly a decade — a very short time in the life of an 11,000 year old glacier– and that the subsequent drying represented a return to “normal” conditions, as illustrated in the accompanying long term lake-level graph from [Nicholson and Yin, 2001]. In fact, a few wet years around 1960, and a moderate shift to wetter conditions in subsequent years, restored the Lake Victoria level to within 1.5 meters of its high-stand. This level is comparable to the level in the decade preceding the 1880 wet spike, and considerably greater than the values estimated for the earlier half of the 19th century. Even more significantly, the Kilimanjaro glacier survived a 300 year African drought which occurred about 4000 years ago, as inferred from the ice core record [Thompson et al, 2002]. This drought was so severe that it has even been implicated in the collapse of a number of civilizations that were subjected to it. If the Kilimanjaro glacier has survived earlier precipitation fluctuations, what is different this time around that is causing its imminent disappearance, if not for something associated with anthropogenic climate change? Figure 4: Lake Victoria level data, after Nicholson and Yin (2001). The lake acts somewhat like a huge rain gauge, so that lake level is a proxy for precipitation. Data before 1840 is not based on individual year level measurements, but historical reports of general trends. Kaser et al also argue that surface and mid-tropospheric (Kilimanjaro-height) temperature trends have been weak in the tropics, in “recent decades.” One of the papers cited in support of this is the analysis of weather balloon data by [Gaffen et al, 2000], which covers the period 1960 to 1997. It is true that this study shows a weak (cooling) trend in mid-tropospheric temperatures over the short period from 1979-1997, but what is more important is that the study shows a pronounced mid-tropospheric warming trend of .2 degrees C per decade over the full 1960-1997 period. Moreover, few of the sondes are in the inner tropics, spatial coverage is spotty, and there are questions of instrumental and diurnal sampling errors that may have complicated detection of the trend in the past decade. Analysis of satellite data by [Fu et al, 2004] reveals a tropical mid-tropospheric temperature trend that continues into the post-1979 period, at a rate of about .16 degrees C per decade. When one recalls that tropical temperatures aloft are geographically uniform, this data provides powerful support for the notion that East African glaciers, in common with others, have been subjected to the influences of warming. Set against this is the surface temperature record from the East African Highlands, reported by [Hay et al 2002]. This dataset shows little trend in surface temperature over the location covered, during the 20th century. However, surface temperature is more geographically variable than mid-tropospheric temperature, and is strongly influenced by the diurnal cycle and by soil moisture. The large decadal and local variability of surface temperature may have interfered with the detection of an underlying temperature trend (more “noise” less “signal”). It is unclear whether this estimate of temperature trend is more relevant to Kilimanjaro summit conditions than the sonde and satellite estimate. Because of the great deal of energy needed to remove mass by sublimation, the ablation rate will be very insensitive to changes in conditions — whether air temperature or precipitation-determined surface reflectivity — in circumstances where all ablation is due to sublimation. The discussion in [Kaser et al] is often misread as meaning that the high,cold Kilimanjaro glaciers are only influenced by sublimation. However, there is both theoretical and observational evidence that melting now occurs on the horizontal surfaces of the Kilimanjaro Northern Ice Field, and contributes to ablation [Moelg and Hardy 2004; Thompson et al 2002]. According to [Thompson et al 2002], “Melt features similar to those in the top meter did not occur elsewhere in the NIF or SIF cores.” Thus, there is evidence that the Kilimanjaro glacier has recently entered a new ablation regime. If the melting were solely due to the albedo reduction coming from the 19th century precipitation reduction, it should have shown up much earlier. [Kaser et al] also specifically identify melting as the main mechanism for retreat of vertical ice cliffs. Once melting comes into the picture, ablation rate becomes much more sensitive to air temperature. Energy and mass balance studies on Kilimanjaro cover barely two years, and define neither trends nor the long term ablation rate. Nonetheless, the studies can be used to provide some preliminary estimate of how much precipitation or temperature change must be invoked to explain the current net ablation of the glacier. According to [Moelg and Hardy, 2004], if air temperature were 1 degree C colder than at present, the potential ablation would be reduced by 14.2 millimeters per month (liquid water equivalent). This is a far from insignificant change, amounting to 32% of the measured net ablation during the short period for which data is available. This sensitivity estimate is not the last word on the subject, because of uncertainties in the approximate formulae used to compute the terms in the energy balance, and neglect of possible effects of water vapor feedback on the surface budget. As for precipitation, [Moelg and Hardy, 2004] tentatively conclude that the glacier might be in positive mass balance if snowfall were increased to its 1880 maximum rate, even if temperature is held fixed at its present value. In this estimate, only 4 .2mm per month of liquid water equivalent are due to the mass added by enhanced precipitation; the vast majority of the effect (72mm per month of decreased ablation) is due to the effect of precipitation on reflectivity. Concerning this effect, one should note that the measured ablation differed by a factor of two between the two years studied, even though annual mean snowfall was similar in both years. This underscores the fact that ablation (via the reflectivity effect) depends on the seasonal distribution of snowfall. This unpleasant fact undermines efforts to relate glacial history to proxy data like lake-level history, which are sensitive only to annual means. A further point of note is that the calculated sensitivity of ablation to precipitation is as high as it is only because of the occurrence of melting. The sensitivity would be reduced if sublimation were really the only ablation mechanism. It might well be that the snowfall rate of the 1880’s was so large that, if it had persisted, it would have allowed the glacier to survive despite whatever warming it suffered in the 20th and 21st centuries. But what significance is there in the thought experiment of holding precipitation fixed at its maximum 19th century value, given that other parts of that century were evidently no wetter than today? To be convincing, any model used in precipitation vs. temperature attribution studies of Kilimanjaro retreat would have to pass the test of accounting for why previous dry periods in the 11,000 year history of the Kilimanjaro glacier did not cause the glacier to disappear. No model has yet been subjected to this test. Employing much the same palette of facts and observations as invoked by [Kaser et al], one could paint this rather different picture of what is going on: The Kilimanjaro glacier has waxed and waned since the time of its inception about 11,000 years ago. An unusually wet decade around 1880 put the glacier into strongly positive mass balance, bulking up its mass. Early 20th century explorers found the glacier recovering towards equilibrium from this anomalous state. However, rather than finding a new equilibrium in the 20th century, the glacier has continued to retreat, and is now on the brink of disappearing. Though air temperature has so far remained below freezing, melting has begun to occur, and the glacier is suffering net ablation over its entire surface. Air temperature increases similar to those observed aloft since 1960, amplified by associated increases in humidity, account for a significant portion of the enhanced ablation leading to this strongly negative mass balance, but the exact proportion is highly uncertain because of the short span of energy and mass balance observations. However, changes in the distribution of snowfall through the year, conceivably linked to increases in sea surface temperature, may have reduced the reflectivity of the glacier and played an even bigger role in forcing the retreat than changes in air temperature alone. When the interesting and thought-provoking work of [Kaser et al] emerged from the machinery of the skeptics’ disinformation operation, it had mutated beyond all recognition. The reports put out by the Heartland Institute (here and here) are typical. The first of these, which came out under the banner “Global Warming Fears Melting,” is headed by a quote from Patrick Michaels starting, “Kilimanjaro turns out to be just another snow job …” and goes downhill from there. All subtlety, tentativeness, context and opposing evidence has been lost. The study is presented as a broadside on one of the central tenets of global warming, in a fashion echoing skeptics’ coverage of the “hockey stick” issue. Even when the work is quoted directly, it is quoted without the context needed to make sense of the claims. Notably, the quote “Mölg and Hardy (2004) show that mass loss on the summit horizontal glacier surfaces is mainly due to sublimation (i.e. turbulent latent heat flux) and is little affected by air temperature through the turbulent sensible heat flux.” is intended to give the impression that air temperature can make no difference, whereas we have seen that the results of [Moelg and Hardy,2004] are compatible with several ways in which air temperature can affect ablation. The skeptics’ press, especially as echoed in Crichton’s State of Fear states that the Kilimanjaro retreat can have nothing to do with anthropogenic global warming, because it began in the 1880’s, before any appreciable CO2 response is expected. The error in this reasoning was discussed in the previous section. This situation here is reminiscent of the ubiquitous “Little Ice Age” problem. It is a fact of life for attribution studies that the climate changes associated with the end of the Little Ice Age overlap with the beginning of the era of industrial warming. Thus, a graph will always give the superficial impression that the present trends are just a continuation of something that began before human influences were much in the picture, leading one into the fallacy that the causes of the beginning of the trend are the same as those responsible for its continuation. The omission of the original article’s long passage between the two quotes gives the misleading impression that it is the pendulum of scientific opinion in the community of researchers that has swung. In reality, what Revkin was saying was that, so far as activism goes, the pendulum had swung towards the use of Kilimanjaro by global warming skeptics. Generally speaking, lower glaciers which extend below the elevation where above-freezing air temperatures occur, are more sensitive to temperature. [Kaser and Osmaston 2002] calculate that such tropical glaciers are even more temperature-sensitive than midlatitude glaciers. A warming of 1 degree C is sufficient to raise the equilibrium line (below which net ablation occurs) by fully 300 meters. As we’ve already seen, warming is by no means unimportant to the 20th century retreat of the Lewis glacier (Mt. Kenya) in E. Africa. In other cases, the role of warming is yet more clear. Data from the tropical and subtropical Andes suggest that changes in precipitation and cloud cover in the latter portion of the 20th century are minor, and that changes in these quantities are unlikely candidates for explaining Andes glacier retreat. (see the discussion in [Francou et al, 2003]). Tropical Andes temperature increased at a rate of at least .1 degrees C per decade since 1939, and the rate has more than tripled over the past 25 years. Specific humidity content of the air has increased, as expected as part of the conventional water vapor feedback, but in fact relative humidity also increased between 1950 and 1990, indicating a stronger water vapor feedback than given by the conventional assumption of fixed relative humidity. Detailed studies of the energy balance and ablation of the Zongo and Chacaltaya glaciers support the importance of air temperature increase, and identify the increase in downward infrared radiation as the main way that the effect of the warmer air is communicated to the glacier surface [Wagnon et al. 1999; Francou et al, 2003]. In the subtropical Himalayas, there is evidence from ice-core isotopic data and from nearby stations for unusual 20th century warming [Thompson et al, 2003]. These are in the outer Northern Hemisphere subtropics. Thus, we have evidence for a warming effect on glaciers over a range of tropical latitudes in S. America, evidence for warming in the Northern subtropics in Asia, some evidence for a role of warming at the Lewis glacier in E. Africa, evidence for general tropical mid-tropospheric warming from sondes and satellites, and a firm theoretical reason to believe tropical free-tropospheric temperature to be geographically uniform. It would take a rather perverse (though not impossible) set of circumstances to leave Kilimanjaro out of the picture. Kilimanjaro has attracted special attention not because it is an unusually important indicator of tropical climate change, but because it is well known through the widely read Hemingway short story. If anything, it is the widespread retreat of the whole population of tropical glaciers that provides the most telling story. Perhaps one can regard the Kilimanjaro glaciers as a kind of “poster child” standing in for this whole population. It is not yet clear whether this photogenic and charismatic poster child is a good choice for the role. Certainly, if Hemingway had written, “The Snows of Chacaltaya,” life would be much simpler. Based on what is now known, it would be highly premature to conclude that the retreat and imminent disappearance of the Kilimanjaro glaciers has nothing to do with warming of the air, and even more premature to conclude that it has nothing to do with indirect effects of human-induced tropical climate change. On the contrary, a study of the glaciers’ long history argues powerfully that the recent retreat is happening in an environment significantly different from that which the mountain experienced during past equally dry periods. To better understand what Kilimanjaro and other tropical glaciers are telling us about climate change, one ultimately ought to drive a set of tropical glacier models with GCM simulations conducted with and without anthropogenic forcing (greenhouse gases and sulfate aerosol). There are substantial challenges to doing so: uncertainties in modeling the energy balance terms, general difficulties in modeling regional climate change, and insufficient resolution of mountains and their mesoscale circulation patterns. The time is ripe to make the first attempts at this, and hopefully such efforts will bear fruit within the coming decade. The attempt to reconcile simulated warming patterns with the tropical glacier record will shed a lot of light on the influence of a range of climate feedback factors — including convection, clouds and water vapor — and the ability of models to faithfully represent them. Because of the strong effect of fresh snowfall on the ability of a glacier to absorb sunlight, it is likely that changes in precipitation amount or pattern will prove to be part of the story. An interesting thing to watch is the effect of precipitation trends over the next decade or two. Most GCM’s predict that, while some parts of the tropics get drier in response to anthropogenic greenhouse gas increases, the net tropical precipitation increases. Thus, some areas of the tropics should experience substantial increases in precipitation, which, at high elevations, will come in the form of snow. If tropical glaciers continue to retreat despite an increase in precipitation, that will constitute a powerful case for the role of air temperature. Interestingly, East Africa is one region where IPCC models predict precipitation increases for the coming century. It will be the height of irony if it turns out that the IPCC models are right, but that Kaser et al are also right, that the Kilimanjaro glacier therefore begins to advance again AND that proves to help confirm the validity of the global warming forecasts! Keep a close eye on the real-time radar satellite monitoring of the level of Lake Victoria here. More understanding will result as detailed, accurate glacier and regional climate modeling becomes possible. This enterprise will not only help in understanding the nature of modern climate change, but will permit us to decode the record of past climate changes hidden in tropical glaciers. The general understanding of how the climate system responds to natural and anthropogenic forcings will improve as a result. Ultimately this is much more interesting and much more important than whether or not Greenpeace chose wisely in picking a place to unfurl their banner. Acknowledgements: Many thanks are due to Doug Hardy, Thomas Moelg and Lonnie Thompson for many patient and illuminating discussions concerning theory and observations of tropical glaciers. Francou B, Vuille M, Wagnon P, Mendoza J and Sicart J-E 2003: Tropical climate change recorded by a glacier in the central Andes during the last decades of the twentieth century: Chacaltaya, Bolivia, 16S. JOURNAL OF GEOPHYSICAL RESEARCH, VOL. 108, NO. D5, 4154, doi:10.1029/2002JD002959. Fu Q, Johanson CM, Warren SG, and Seidel DJ 2004: Contribution of stratospheric cooling to satellite-inferred tropospheric temperature trends. Nature 429,55-58. Gaffen DJ, Santer BD, Boyle JS, Christy JR, Graham NE, Ross RJ. 2000. Multidecadal changes in the vertical te mperature structure of the tropical troposphere. Science 287: 12421245. Hastenrath S. 1984. The Glaciers of Equatorial East Africa. Reidel: Dordrecht. Hay SI, Cox J, Rogers DJ, Randolphs SE, Stern DI, Shanks GD, Myers MF, Snow RW. 2002. Climate change and the resurgence of malaria in the East African highlands. Nature 415: 905909. Kaser G, Hardy DR, Mölg T, Bradley RS, and Hyera T 2004: Modern glacier retreat on Kilimanjaro as evidence of climate change: Observations and Facts. Int. J. Climatol. 24: 329339. Kaser G, Osmaston H. 2002. Tropical Glaciers. Cambridge University Press: Cambridge. Kruss PD. 1983. Climate change in East Africa: a numerical simulation from the 100 years of terminus record at Lewis Glacier, Mount Kenya. Zeitschrift f¨ur Gletscherkunde und Glazialgeologie 19: 4360. Mölg T, Hardy DR. 2004. Ablation and associated energy balance of a horizontal glacier surface on Kilimanjaro. Journal of Geophysical Research. 109, D16104, doi:10.1029/2003JD004338. CENTURY AS INFERRED FROM THE RECORD OF LAKE VICTORIA. Climatic Change 48: 387398. Pierrehumbert RT 1995: Thermostats, Radiator Fins, and the Local Runaway Greenhouse. J. Atmos. Sci. 52, 1784-1806. Sobel AH, Nilsson J, Polvani LM 2001: The weak temperature gradient approximation and balanced tropical moisture waves JOURNAL OF THE ATMOSPHERIC SCIENCES 58 (23): 3650-3665. “Recent warming”: ice core evidence from tropical ice cores with emphasis on Central Asia. Global and Planetary Change, 7, 145-156. Thompson LG, Mosley-Thompson E, Davis ME, Henderson KA, Brecher HH, Zagorodnov VS, Mashiotta TA, L in PN, Mikhalenko VN, Hardy DR, Beer J. 2002. Kilimanjaro ice core records: evidence of Holocene climate change in tropical Africa. Science 298: 589593. Thompson LG, Mosley-Thompson E, Davis ME, Lin P-N, Henderson K and Mashiotta TA, 2003: TROPICAL GLACIER AND ICE CORE EVIDENCE OF CLIMATE CHANGE ON ANNUAL TO MILLENNIAL TIME SCALES, Climatic Change 59: 137155. Wagnon PW, Ribstein P, Francou B, and Pouyaud B 1999: Annual cycle of energy balance of Zongo Glacier, Cordillera Real, Bolivia. Journal of Geophysical Research. 104D4, 3907-3923. Reading this, I am struck by how such small warming changes in the tropics have set off big changes in low-latitude high-altitude glaciers, just as small changes in the Milankovitch variables create large-scale climate changes making the Ice Ages and interglacials over thousands of years. In this case, however, the changes are very rapid — these glaciers have been robust over the same time scale (many millennia). The misleading use of Kilamanjaro (deforestation?) by skeptics is reprehensible given the general meltdown. Glad to see Lonnie Thompson’s work here on RC. The proverbial Canary in the Coal Mine. Thank you for the article. What impact, if any, does soot and black carbon from fires have on the glaciers of Kilimanjaro? Wasn’t the referenced Fu et al, 2004, the Nature article that John Christy and Roy Spencer claimed was due to improper methodology they had previously throw into the trash? Wasn’t it the article whose methodology was criticized in another Nature publication later in the year (Tett and Thorne) – particularly when it came to the tropics? Didn’t Fu susequently change his methodology for a publication later that year in the Journal of Climate? The Fu article must have still reached the requirements under the peer-review process if it made it into Nature. I guess the later criticism, even if it were valid, did nothing to throw the article’s findings into disrepute. Maybe the Tett and Thorne criticisms were taken into account and Fu improved on the previous study (which would make the J. of Climate article’s findings even more solid). Many thanks for the interesting and detailed article. Regarding the satellite data, there is a detailed (4 Mb pdf) article by Scott Church which I found informative- page 59 onwards discusses the Spencer and Tett and Thorne criticisms. Along the same lines, have you considered a RealClimate article on the satellite record? Even though the exact warming trend seems to be hotly contested and not clear, it would at least be a useful counter to those claims (still repeated) that it doesn’t show warming or falsifies the surface record, as well as being interesting in its own right. Re#4 – I’ve seen conflicting reports of what the Dec 2004 Journal of Climate trend was reported to be. Spencer says it’s as low as 0.09 deg C/decade for the whole troposphere, which is much closer to what Christy and Spencer report for the lower troposphere. But I’ve seen press releases claim Fu shows a full 0.2 deg C/decade, which is what the Nature article had claimed. Maybe those are just the high and low end estimates based on error? The Tett and Thorne criticisms were published at basically the same time as Fu’s JofC article, so I’m not sure they were incorporated. Christy and Spencer still see methodological flaws they feel introduce errors. Re#5 – One of Spencer and Christy’s complaints was that they didn’t get an opportunity to review and comment on Fu’s article despite being arguably the top experts in the area (and despite usually getting to review submissions on the topic). They found some of the errors embarassing and unacceptable for publication. Other people see otherwise, but it still seems peculiar they wouldn’t have been asked to review. Re#6 – That’s a lot to digest! I did see a few things upon cursory review of the section on Fu that I have issues about. I’ll have to revisit it when I have a lot of free-time! This is a great post. It took a long time to read it all but it is very informative. Many thanks to Raymond Pierrehumbert and to Thomas Moleg for the comment on the previous post. re #1 my educated guess about the effects of soot on glaciers would be if the soot were to settle on the glaciers it would have the same effect of natural soil and rock. Snow reflects most of sunlight but soot, like soil and rock has a lower albedo (am I using the term correctly?) and instead of reflecting sunlight absorbs it. When the soot absorbs the sunlight it warms and could increase the melting of the glacier. On the other hand, this is a big maybe, soot and other pollution when it is in the air I am guessing could reduce the strength of sunlight that reaches the glacier and this possibly could reduce the melting. If I don’t know what the heck I’m talking about please feel free to tell me! New research published in Science Express reports on results showing the East Antarctic ice sheet is thickening, thus partially offsetting sea level rise due to the melting in the WAIS, Greenland and the world’s glaciers. Here’s a Science Daily news release A race through thick and thin ice on the story. A related story about some results of the British Antarctic Survery has been published here by the Chicago Tribune. Read the article with great interest. Thanks for author’s effort. trends versus the surface temperature trends in units of K per decade for 1979 – 2004: the tropospheric temperature trends are astonishingly uniform along the equator with a variation of about a factor of 5 smaller than that in the surface temperature trends. For 1979-2004 over the tropics (30S-30N) the tropospheric temperature trend is about 0.195 K/decade. 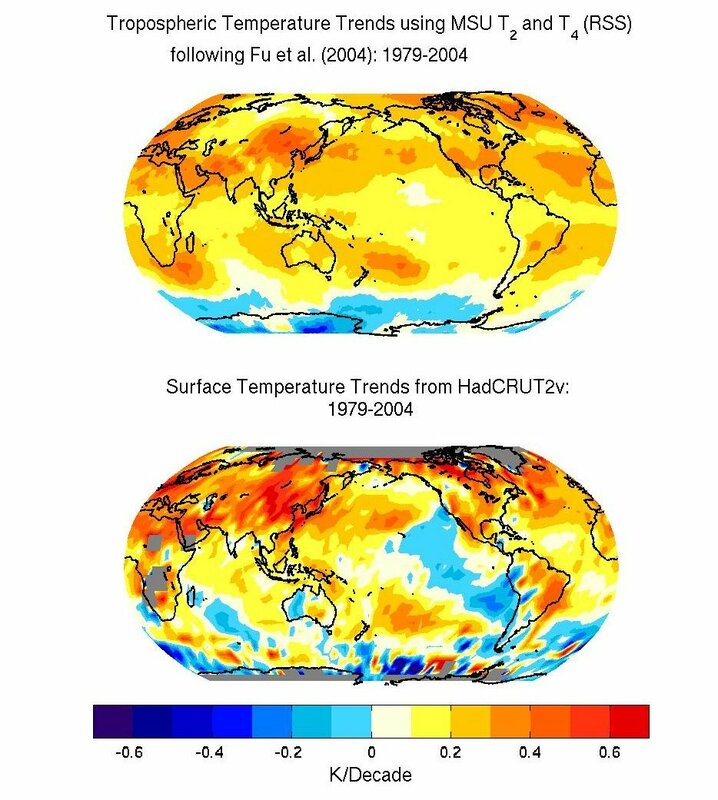 tropospheric temperature trends” by Fu and Johanson (2005, Geophysical Research Letter, in press). Hello, slightly offtopic here, but recently there were press reports about findings of very fast and extended glacier retreats in the Swiss Mountains several times during the last 7 or so millennia. To my impression, these findings don’t in any way contradict AGW findings, rather give more detailed insight in local glacier growth and retreat in history. Yet the “sceptics” jump on these findings similar as they did with tropical glacier retreat (hence my article here). Any comments? Re#4 – It’s my understanding that the warming of the whole troposphere went from 0.2 deg C/decade (according to press releases) in the first pub to 0.09 deg C/decade in the 2nd (according to Roy spencer). Press releases still claim that the 2nd article backs-up the 1st claim of 0.2 deg C/decade. Maybe the varying reports are due to low and high range error bars? Re #5 – Christy and Spencer have been quite critical that as arguably the top experts in the analysis of satellite date for temperature information, they have stopped receiving papers for review as part of the peer review process (in particular, they were upset at not receiving the Nature article for review due to the errors they felt were significant and obvious to them). I don’t think Fu’s 2nd paper took into account T&T’s critique because they were both published at about the same time (same month, I believe). In regards to Michael Jankowski’s comment (#11), the Fu et al. (2004, Nature) article showed that the satellite record of tropospheric temperature trends, based on the Microwave Sounding Unit channel 2, is contaminated by stratospheric cooling on the order of -0.08 K/decade. When this contamination is removed from the Remote Sensing Systems channel 2 record, the resulting tropospheric trend is 0.18 K/decade during 1979-2001. When it is removed from Spencer and Christy’s channel 2 record, the trend is 0.09 K/decade. Fu and Johanson (2004, J. Climate) derived the same stratospheric contamination in the channel 2 record as Fu et al. (2004), but through alternate methodology. This article served as an independent check of the original results. The issues raised by Tett and Thorne (2004, Nature) were effectively rebutted by Fu, Seidel, Johanson, and Warren in the same issue of Nature (Dec, 2004). See the response to Tett and Thorne here. I’d like to thank Quian Fu (#9) for commenting here. And since he as done so, perhaps comments like Michael Jankowski’s could be addressed to him instead of me (#4) or Stephen Berg (#5). What I get from Fu’s paper is that the tropics are warming at 0.13C/decade at the surface (citing Jones and Moberg, Journal of Climate 16, 206-223, 2003) and that the troposphere is warming at 0.18C/decade generally (Fu et. al 2004) and, from his comment here, 0.195C/decade in the tropics. This certainly speaks to the rapid ablation of tropical glaciers. The tropics are not warming nearly as much as the high latitudes of the northern hemisphere. So the tropical (30N-30S) surface warming is less than the global surface trend of about 0.17C/decade – but again, apparently still enough to have substantial effects on tropical glaciers. I hadn’t noticed that Dr. Fu had posted here until now. I didn’t see my first posting (#7) show-up for a day or two, so I thought it had gotten lost or discarded for some reason, hence my second and quite simlilar post #12. I apologize for the duplicity. As for the addressing of the posts to you or Stephen Berg, my comment about peer-review in #7 and #12 is a direct response to the issue raised by Stephen Berg in #5. As for addressing my comments in general to Dr. Fu himself (had I known he was posting/reading here): I simply pointed-out that Christy and Spencer (and others) have taken issue with Fu’s approaches and results. I know Dr. Fu is well aware of this, but I was not sure all of the readers were. Thanks for the clarifications. I hope to be able to read all of the satellite-derived temperature articles at some point instead of just getting what I can from press releases and commentaries. It depends which record you use, i.e RSS or UAH (Spencer & Christy). It’s 0.18 K/decade for RSS but only 0.09 K/decade for UAH. I think what Fu & Johanson are saying is that Channel 2 receives about 85% of it’s signal from the troposphere and the rest from the stratosphere. Since the stratosphere has been cooling this has damped the effect of the warming in the troposphere. The cooling effect is about -0.08 K decade. As far as I know Spencer & Christy don’t actually use Channel 2 (T2) readings directly but use some method which removes the stratospheric signal. This gives a warming trend of about 0.06 K/decade. I’ve briefly read the Fu et al link. They seem to have used a linear combination of T2 and T4 (stratosphere exclusively) to determine the ‘true’ tropospheric temperature. They obtained the coefficients for T2, T4 by equating the readings with radiosonde observations. Can anyone confirm that I have got this right – thus far? If so why not just use the radiosonde readings? I’ve just noticed that the last post to this thread was almost a week ago so I may be wasting my time. FWIW, Spencer’s brief critique – http://www.techcentralstation.com/120304F.html. Christy claims the results he and Spencer have match radiosonde readings better (see his comments in the link of #4 above).